Growing up in Wisconsin, we had a summer ritual. The family would pick buckets full of pie cherries from Door County. Once we got them home we would pit, and pit, and pit them. Then my mom would bake some into cherry pies and freeze the rest for future pies and crisps. Here in Colorado I have a new ritual. Peaches. I didn’t care much for peaches when I was growing up. But at that time, my experience with the fruit was mostly with the canned version. 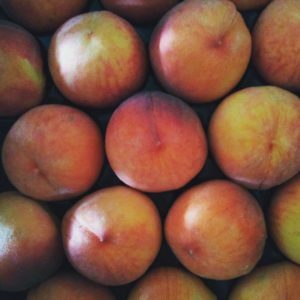 I heard about, and tried, Georgia peaches and Michigan peaches—people claimed they were the best—but none impressed me. They seemed only as good as the canned version. Then I tried a ripe Palisade peach, grown in the Western Slope of Colorado. Now I order them by the case. Unfortunately peach season is nearing the end, as are the peaches I purchased this month. I bought two cases, one in early August and another that arrived two weeks later. The plan was to eat and share that first batch and freeze the second batch. All went according to plan, until we got the second case. They are so incredibly sweet and juicy we could not resist eating them. Now we are down to the last two dozen. At the rate we are eating them, they will be mostly gone in a couple more days. It hardly seems worth it to freeze the remainder. There are many health benefits to peaches, as there are with all whole fruits. Peaches are high in vitamin A and a great source of fiber. In China and Japan the peach is associated with immortality and a long life. But I don’t think about those benefits when I eat them. I think about the flavor. Since switching to a whole-food, plant-based diet, fruit like the juicy peaches of Colorado at the peak of freshness, is more thrilling to me than the most gourmet dessert. So this winter when the ice crystals scratch at the windows I may not have peaches to remind me of summer, but I will have my memories. I won’t easily forget this August’s indulgence in two cases of peaches. It’s times like these I love eating a plant-based diet.